The Android market is too fragmented and disparate to support a technically demanding game like Epic's hit Infinity Blade, says company boss Tim Sweeney. Epic Games and Chair Entertainment struck gold with Infinity Blade, a project that looked good when we first saw it, turned out to be pretty awesome, and became the fastest-grossing iOS app of all time. More than anything else, it demonstrated that "core" games could indeed work on mobile platforms like the iPhone and iPad. 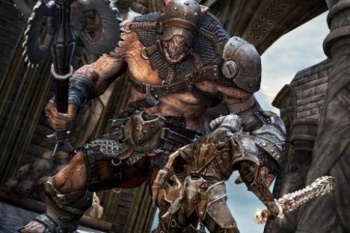 I liked what I played of Infinity Blade on my friends' iDevices, so why can't I get it on my Droid? The problem, says Epic's Tim Sweeney, is that Google isn't quite evil enough - and a lack of stringent standards across all Android devices means that it isn't feasible for Epic to port the game to another large mobile OS. "When a consumer gets the phone and they wanna play a game that uses our technology, it's got to be a consistent experience, and we can't guarantee that [on Android]. That's what held us off of Android," Sweeney told Gizmodo. In other words, developing for iOS means that the game needs to work on iPhone 3/4, iPad/2 and their respective variants, and that's it - while trying to make an Android version would involve making a game for dozens of different phone models, some of which might not have the horsepower to run the game. Sweeney likened it to a hypothetical situation in which Sony released multiple Operating Systems for its new NGP handheld. "If you took the underlying NGP hardware and shipped Android on it, you'd find far far less performance on Android," said Sweeney. "Let's say you took an NGP phone and made four versions of it. Each one would give you a different amount of memory and performance based on the crap [the carriers] put on their phone." If Google wanted to see high-level development on its Android platform, said Sweeney, it needed to be more like Apple, and place tighter restrictions on its developers. "Google needs to be a little more evil. They need to be far more controlling."